A unique quality of OCTOPUZ’s software is that it is ONE software solution to program all robot brands/models in the exact same way. 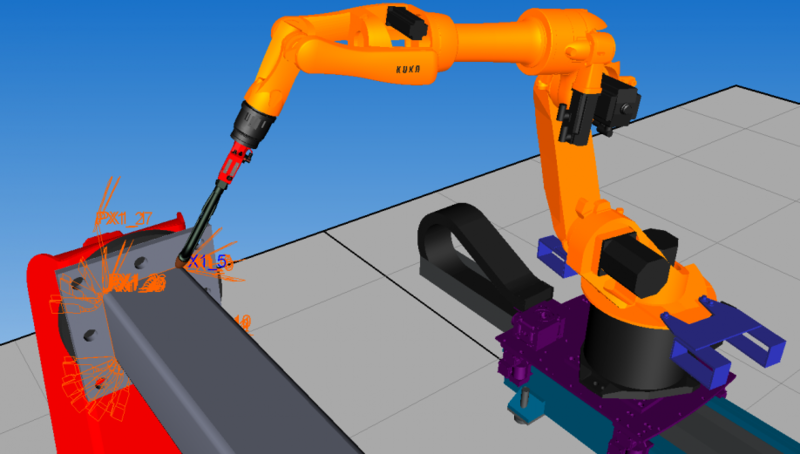 The user can program, simulate and generate code for multiple robots, simultaneously, with full support for external axes including linear rails and rotary positioners. OCTOPUZ is a dynamic solution for high mix, low volume jobs. OCTOPUZ for welding was developed with the approach of looking at the user (rather than the robot) first. The goal is to make the programming process an easy and user-friendly as possible. OCTOPUZ boasts autonomous, intelligent, and intuitive weld creation with automatic torch flare into corners, automatic finding of the start and end of welds, automatic calculation of external rotary axes based on user-selected wire orientation, and parametric and reusable weld creation. OCTOPUZ users can implement a variety of welding strategies such as multi-layer, stitch, weave, seam tracking, touch sensing, and more. Welding specific support from OCTOPUZ robot programming experts is available to all customers for initial and ongoing training and support. Dimic Steel Tech, a metal fabrication and machining service provider in Upland, California uses OCTOPUZ in their work. “OCTOPUZ is a great product that provides many advantages in robot programing. The team at OCTOPUZ really cares about their customers. They do everything they can to help in any way possible. If you have a robot, I strongly recommend this product. “ says Ryan Mansfield, Dimic Steel Tech. It’s safer: With OCTOPUZ’s built-in simulation software, you can be fully confident that the program you are outputting is error-free. All collisions, singularities, joint limits and reach limits are checked before posting. It’s easier to use: While the software is powerful enough to satisfy even the most experienced welders, OCTOPUZ is also intuitive enough for those with more limited knowledge. It’s faster: OCTOPUZ can save days of programming time. A project that would normally require days of manual jogging is just minutes of clicking to create and modify weld paths in OCTOPUZ. It saves money: The nature of offline programming allows you to keep your robots working while new programs are developed and simulated within the software. Productivity never slows down while new paths are being created and tested. By being intuitive, the software helps you save money through reduced training costs and outputting welding paths. OCTOPUZ is the intelligent offline robot programming and simulation software ideal for any path-sensitive application. OCTOPUZ took a revolutionary approach to robotic programming by combining the offline programming of robots with a manufacturing process simulation, perfect for tech as well as sales teams. Today, OCTOPUZ provides a mainstream, versatile, powerful, and effective solution for any robotic challenge. OCTOPUZ is sold, supported and loved worldwide with the help of our network of valuable international partners.